Perfect Corp. marries artificial intelligence (AI) and augmented reality (AR) technologies to create a smart virtual beauty experience that redefines the way consumers, brands, and retailers connect with beauty. NEW YORK--(BUSINESS WIRE)--Perfect Corp., the creators of the award-winning virtual beauty app YouCam Makeup, is set to unveil their full spectrum of smart beauty tech innovations at the Consumer Electronics Show (CES) in Las Vegas, January 8th-11th, 2019. Perfect Corp.’s new patent pending AI and AR solutions use deep learning and neural networks to automatically recognize shapes, colors, and skin pixels from images. The application of these next-generation smart technologies reimagines and personalizes beauty for shoppers, brands, and retailers like never before. The “Beauty 3.0” vision marks a shift in the evolution of digital beauty, away from the traditional impersonal and reactive experience to a highly personalized and proactive one. YouCam’s smart beauty tech, combining AI and AR technologies, makes it possible to experience customized and real-time virtual beauty. YouCam’s “Beauty 3.0” solutions include: AI product recommendations for custom suggestions based on preferences, AI smart shade finder for instant foundation matching for your skin tone, and AI skin diagnostic to detect specific skin concerns and track progress overtime. In addition, guests can experience the latest developments in hyper-realistic virtual makeup trials, live ombré hair color makeovers, and on-demand beauty advisor video consultations that bring a knowledgeable makeup counter professional right to your phone. Perfect Corp will also be hosting a “Beauty and the Tech” keynote and panel on Wednesday, January 9th at 10:20AM at the LVCC North Hall (N253), where Alice Chang will be joined by special guests Jessica Pels (Editor-in-Chief at Cosmopolitan), and Prama Bhatt (SVP Digital & eCommerce from ULTA Beauty), for an in-depth discussion on the future of beauty tech solutions and how they’re being leveraged by brands in the content and retail space. 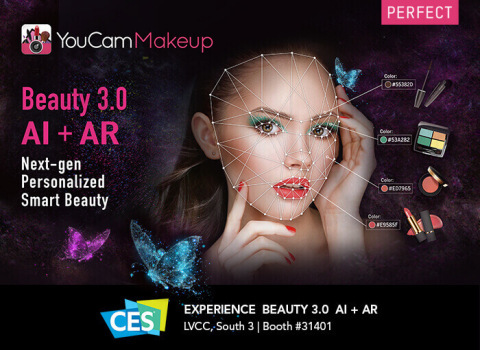 Join Perfect Corp. at booth #31401 located at LVCC, South 3 in the High-Tech Retailing Marketplace to experience the next generation of AI and AR smart beauty innovations with on-site demos to play with the technology firsthand. Perfect Corp. marries AI and AR to create a virtual beauty experience that redefines the way consumers, brands, and retailers connect with beauty.